A beautifully packaged selection of cigars, each Romeo y Julieta Vintage cigar is neatly nestled in a lacquered wooden box equipped with its own humidification device. A premium blond Ecuadorian Connecticut Shade wrapper and a Mexican binder contain a smooth blend of Dominican long fillers, resulting in a mild- to medium-bodied smoke. 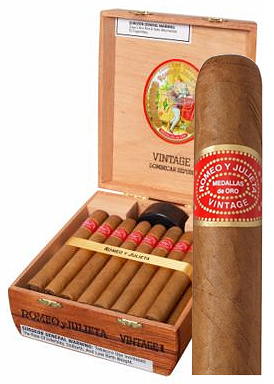 The discerning smoker will never tire of the Romeo Y Julieta Vintage cigar.